India Name Change Forms. Easy to Follow Instructions. Forms for use when changing your name due to marriage or other reason through a legal court proceeding. Name Affidavit (India) This Name Affidavit is designed for use in India. This form is available for immediate download. How do legal name changes work? Changing your name legally is a simple and straightforward process; however, the action surrounding a name change can be a little more complicated. When legally changing your name, there will typically be a few requirements, such as age and required court appearances. Additionally, it will cost some legal fees to change your name and will not happen overnight as the name change has to be processed. Once you’ve decided to change your name, it will help to use a name changing legal kit to become fully aware of your responsibilities in the process, including all proper court filings and state-specific instructions. Why might I need a name change? Although many people believe that legal name changes are rare, we forget the role they play in both marriages and divorces. For that reason, you’ve probably met hundreds if not thousands of people who have changed their legal names at some point. There are, of course, other reasons to change a name legally, ranging from the witness protection program to completely voluntary changes in identity. How do I get started changing my name legally? The best way to begin changing your name is first to identify your reasons. If you’re getting married soon, then a bride name changing legal kit might be one of your best options. A basic name change kit will also work for a variety of situations, though it’s best to seek out the forms most appropriately reflecting your situation. What additional steps must be taking for name change, after legal fillings? Many states have additional requirements for a name change after you have made all of the proper filings. These requirements typically consist of having the petitioner (the person requesting the name change) publish a notice of their name change in a local paper and informing individuals who may be affected by the petitioner’s name change. These requirements may differ in your state which is why it can be important to purchase a state-relevant name change kit. What obstacles might arise when I seek a name change? Aside from failing to meet the basic requirements of a name change (covered in the answer above), there may be additional “hiccups” along the way. For example, it is possible for someone to object to a name change if that name change could adversely affect them. (Similarly, in the case of name change for children under 18, a divorced spouse may have the right to object to a child’s requested name change). A court may then rule that the name change is not in the best interest of the public and therefore reject it; however, such occasions are rare. If a name change is taking longer than two to three months, it’s usually because the name change process has hit some sort of snag; otherwise, you should expect to wait approximately this amount of time after all of the legal requirements of your name change have been met. Can changing my name help me escape debts? No. By changing your name through the court system you will not be able to escape any debts or problems you had under the old name; any legal problems you have will follow you through the name change, even if old contracts were signed under your old name. Ensuring that people do not escape legal and financial problems through name change is part of the reason the process can take a little longer than some would like. What is a Name Affidavit? A Name Affidavit is a form of Affidavit (or written declaration under oath) in which you verify that you are the same person but have been known under a different name. These must be signed in front of a notary and it’s important to remember that if falsified, one can be charged with perjury just as if they had lied on the witness stand. There are two types of Name Affidavits: an Affidavit under penalty of perjury and a Name Affidavit Under Oath. Will I need to sign a Name Affidavit? Not always -- these typically only arise under specific circumstances. Can minors get their names changed? Although there is an age requirement for the petitioner to have their name legally changed, it is still possible for minors to acquire legal name changes. Responsibility for filings and approval fall upon the parents or legal guardians of the child. The court will more carefully review these name changes with an eye on doing what’s best for a child; adults are generally given more leeway to decide for themselves what is best. 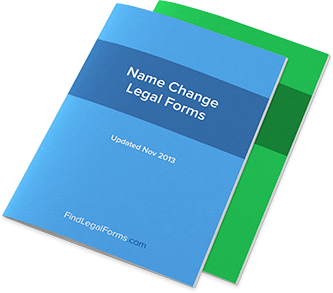 What legal documents and cards are affected by a name change? Everything from your Social Security Administration card to your passport can be affected by a name change, which is another reason that a name change cannot happen overnight. These are especially important to remember in the event of a divorce; a divorce decree document is official notice of your name change, but you’ll have to make sure that all of your other relevant identifying information is changed so that the government is properly notified. Can I get a name change simply because I want one? Provided you meet the other requirements of a name change (being of legal age, the name is consistent with the public interest, etc. ), you can change your name simply because of a matter of personal preference. Though most people get a name change for another reason (such as marriage or divorce), a name change through personal preference is actually a relatively common reason for acquiring a legal name change. Can I change my name back to its original state? Yes -- this most commonly happens in the event of divorce, but you will still have the freedom to go back to your original name if you changed it for a reason other than marriage. It might take more time than you like to go back to your old name, but it is still the same process.